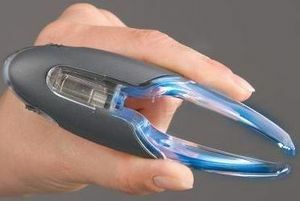 These tweezers have two integrated LEDs that turn on when the slightest pressure is applied to the gripping arms, providing illumination where it is needed most during the delicate removal of splinters or whenever the tweezers are used. Unlike steel tweezers that can corrode, these are made of rust- and shatterproof polycarbonate, and each tip has three interlocking gripping ridges for strong traction during use. Includes three CR 2025 batteries. 4-3/4"L x 1-1/2"W x 3/4"D.
Far more use for splinters is a 10x jeweller's loupe. A good reading lamp provides the light and the splinter looks like a 4x2.